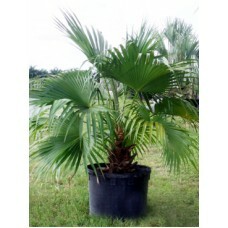 The Chinese Fan Palm is a much-loved palm and makes a superb potted palm for the home or terrace. In warmer climates and over a period of years, it grows into a handsome, medium-sized tree with a slender trunk. The broad, lime green leaves have elegantly drooping and curled tips, which gives rise to its other name, "Fountain palm." The fruits, which are produced in large numbers, are blue. Livistona chinensis shows a good tolerance to cold and frost and may be used in the sheltered temperate garden, but will also happily accept hot and humid tropical conditions.